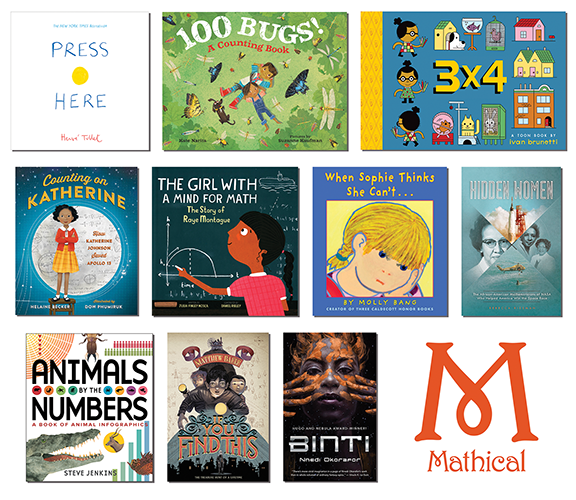 2019 Mathical Book Prize Winners! For Pre-Kindergarten, the Mathical Award Winner is Crash! Boom! A Math Tale, by Robie H. Harris (Candlewick Press). For Grades K-2, the Mathical Award Winner is Nothing Stopped Sophie: The Story of Unshakable Mathematician Sophie Germain, by Cheryl Bardoe (Little, Brown Books for Young Readers). For Grades 3-5, the Mathical Award Winner is The Miscalculations of Lightning Girl, by Stacy McAnulty (Random House Children’s Books). For Grades 6-8, the Mathical Award Winner is To the Moon! The True Story of the American Heroes on the Apollo 8 Spaceship, by Jeffrey Kluger and Ruby Shamir (Philomel Books for Young Readers). The Mathical Book Prize is awarded by the Mathematical Sciences Research Institute (MSRI), in partnership with the National Council of Teachers of English (NCTE) and the National Council of Teachers of Mathematics (NCTM), and in coordination with the Children’s Book Council (CBC). Selected winning titles are distributed to children in need in the Bay Area with the support of First Book and the Firedoll Foundation, who have also underwritten the creation of reading guides for families. The Mathical list is intended as a resource for educators, parents, librarians, children, and teens. To view the full list of Mathical titles, visit mathicalbooks.org.